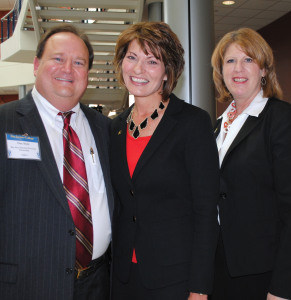 San Jacinto College Chancellor Dr. Brenda Hellyer, center, and Vice Chancellor Teri Crawford thank Bay Area Houston Economic Partnership’s Dan Seal for his help with the State of the College Program, presented to the community at San Jac South. San Jacinto College is growing faster than we might realize, Chancellor Dr. Brenda Hellyer told a crowd of community leaders invited to the State of the College Luncheon. In fact, the number of degrees awarded has almost doubled since 2006 – from 2,682 that year to 5,012 this past year. And,4,968 of those students transfer to four-year institutions. “We’re not only the most affordable school in town, we work to keep taxes affordable also,” she said of the college that was created in 1960 in Pasadena and is now the seventh largest college in Texas and the third largest in Houston. In-district students pay only $47 per credit hour plus a $140 general service fee or $704 per semester – not including books and some other small fees. Out-of-district students pay $89 per hour or $1,208 per semester, plus the $140 general fee with out-of-state students paying more than twice as much as in-district students. Breaking down the fall enrollment total of 28,020, she supplied quick facts sheets showing the Central Campus is the largest with 13,612 students. The South Campus has 10,921 students while 7,585 attend the North Campus. Almost 21,000 students attend part time while 7,112 are full time. The chancellor said the average age is 23, and 77 percent of San Jac students are the first in their families to attend college. “We take everyone,” she said, going on to explain that “If our students don’t succeed, then we don’t succeed” – which also means helping many students get over their fear of math. 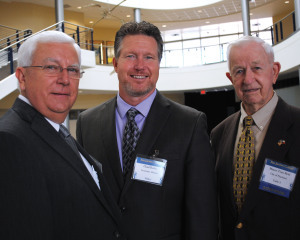 Port Commissioner John Kennedy, from left, talks with Economic Alliance President Chad Burke and Pearland Mayor Tom Reid as they await the start of San Jacinto College’s State of the College Luncheon at the South Campus. 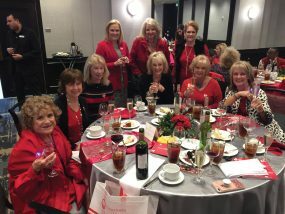 “This (the luncheon) is really a celebration of all we’ve done to focus on student success,” she said, adding that San Jacinto College is the hub of industries that drive the Bay Area Houston economy, such as NASA and the Port of Houston. 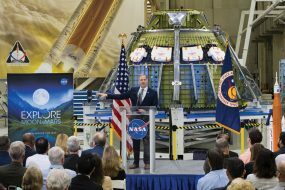 Besides partnerships with Boeing, Lockheed Martin, the Johnson Space Center and Space Center Houston, the college offers the only degree program in Texas in mariner technology. The college currently owns waterfront property in the Port of Houston’s Bayport Terminal, where the college’s new Maritime Complex will be built. Many outside maritime industry partners are being consulted to make certain the college builds the very best facility possible. The luncheon was sponsored by Bay Area Houston Economic Partnership and the Economic Alliance Houston Port Region.